The decisions we make about energy shape our present and our future. From geopolitical tension to environmental degradation and an increasingly unstable climate, these choices infiltrate the very air we breathe. Energy security politics has direct impact on the continued survival of human life as we know it, and the earth cannot survive if we continue consuming fossil energy at current rates. The low carbon transition is simply not happening fast enough, and change is unlikely without a profound shift in how we approach energy security. But thinking on energy security has often failed to keep up with these changing realities. Energy security is primarily considered to be about the availability of reliable and affordable energy supplies—having enough energy—and it remains closely linked to national security. But energy security cannot just involve making sure states have sufficient supplies of energy. We cannot secure states in isolation, and energy security cannot be separated from other security concerns: how energy security is pursued directly affects all of our futures. In a world that is increasingly interconnected, we need to reconsider both what we mean by security and how we approach it. Today, the traditional distinction between referent objects (the idea that we can secure the state, or the environment, or the climate, as distinct objects when they are connected), and ‘the logics of inclusion and exclusion’ that national security politics are based upon (the idea that we could – or even should – secure some and not others), simply do not make sense. Although our need for energy is both fundamental and biological, the link between energy and national security is not inevitable. As the very nature of threats change and the world becomes more interconnected, we need new priorities, new thinking and new norms of behaviour. Today, the argument that security needs to move away from traditional geopolitical premises is not simply a case of ethical preferences: it is strategically necessary. If security is about survival, then the national security project is failing. Thus, the energy security paradox describes a situation in which state energy security practices result in less security for states, human beings, and the environment. Of course, these consequences are not intentional. They could even be termed collateral damage resulting from our energy choices. But these ‘new’ global insecurities cause increasing devastation and we cannot continue to ignore them when we talk about energy security. Crucially, these practices are not inevitable. Although China is increasingly focused on combating climate change, it faces a complicated and difficult transition from a heavily coal-dependent energy system. China has made impressive commitments and progress on renewable energy production, but when it comes to energy security, continuing domestic production of coal, oil, and gas to ensure stable supplies and prices by keeping China self-sufficient in energy continues to take precedence. This creates the first level of the security paradox, reproducing insecurity in traditional terms. It leads to a mind-set where ‘we’ should secure ‘our’ supplies, and others are seen as competitors who may threaten this goal, producing zero-sum competition over energy. This attitude has seen Chinese companies undertake contentious deals abroad, in some cases contravening international sanctions, and raising international tension. Even China’s improvements in hydropower capacity have been a source of tension, affecting water supplies in downstream nations and damaging relations with affected countries, including Vietnam. All of this works to reproduce insecurity, harming possibilities for cooperation. If we look beyond the state level, it becomes clear that these energy security practices also create insecurities beyond inter-state relations. This constitutes the second level of the energy security paradox. China’s pursuit of short-term supply security undermines longer-term broader security for the state itself, and for its human and non-human inhabitants and ecosystems. So it also causes insecurity above and below the state level, and these harms are not (and cannot be), contained within state borders. Combined with economic growth, China’s obsession with energy self-sufficiency have driven huge increases in energy production and consumption, the vast majority of which is satisfied by domestically available fossil fuels. Despite the focus on climate change and China’s record growth in wind and PV solar power, China’s 2017 power production statistics show that fossil fuels actually accounted for 53% of total power production growth: more than half, and an increase from the year before. 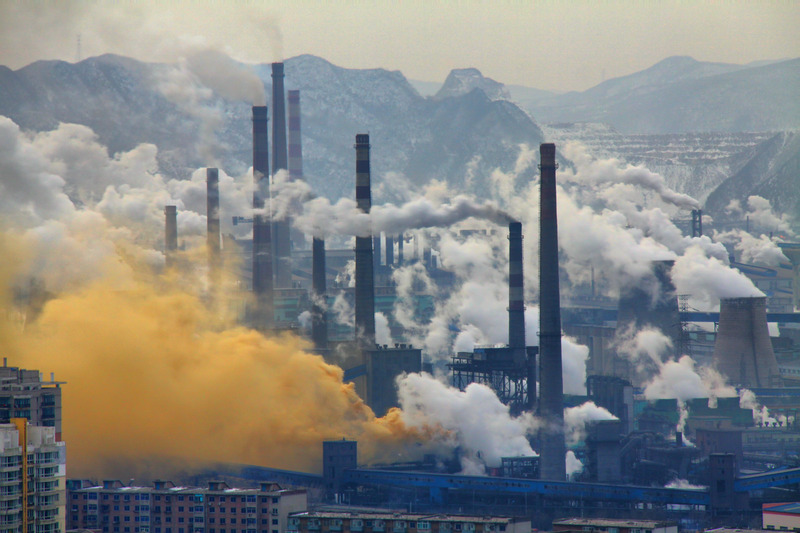 As a result, China is now the world’s top energy-related CO2 emitter, and the majority of its air pollution can be traced back to its addiction to fossil fuels. This is not just bad for the global climate: a 2014 study by the Shanghai Academy of Social Sciences found that pollution has made Beijing almost ‘uninhabitable for human beings’. In 2015, a study cited in the Economist suggested that air pollution is a cause of 1.6 million deaths just in China each year. Yet, even in China, many still view energy security as something that is separate from climate policy. One of my elite interviewees even suggested that the ‘Paris Agreement is not strongly linked to China’s energy security’. But the question of energy is at the heart of dealing with climate change and China’s energy security policies are having a disastrous impact on the global environment and climate as well as on its own environment. China’s energy security practices have global consequences, affecting the global climate and environment in unpredictable and irreversible ways. Even as China starts to shift towards cleaner forms of energy and improves regulation to clean up energy industries, Chinese energy companies go abroad to exploit fossil fuels where domestic regulations do not apply, through schemes like the Belt and Road Initiative. China’s own government assessment notes that ‘China is one of the countries most vulnerable to the adverse impact of climate change’. But there is a complex relationship between security and insecurity here: China’s economic growth is providing security and improving life experiences for millions of very poor citizens, while at the same time it is causing irreversible environmental damage that will affect the future survival of those very same citizens. Today, environmental protection and climate change are taken more seriously, but these targets are often contravened by domestic energy policy. Tension remains between these objectives, but environmental degradation is now in itself becoming a potential threat to stability, which is pushing more action. This can be seen both in China’s increasingly ambitious domestic targets as well as in China’s growing engagement in the global climate negotiations. Energy policy is a fundamental problem for the global climate regime: climate negotiations continue without fully recognising that domestic energy policy just doesn’t match up. Even the International Energy Agency recognize this: they modelled the national commitments made on emissions at the 2015 Paris conference and found a significant gap between the commitments made by states and the goals they are intending to achieve. Energy security has evolved from simply meaning a basic need for energy, to become almost synonymous with protecting state fossil fuel supplies, in the name of national security. But energy security does not have to mean maximising ‘our’ fossil fuel supplies to avoid dependence on others. It could equally involve cooperative measures to develop effective and sustainable energy resources for the benefit of all. My book shows both the problem with common sense energy security practices – the energy security paradox – and the potential for change. It illustrates that this understanding of energy security is not fixed or inevitable: and that even in China a growing number of groups call for change. When we talk about energy security, we need to think about what kind of security we think is desirable. This comes down to bigger ethical questions about what kind of world we want, but these questions are crucial for rethinking energy security to respond to the challenges posed by global climate change. Jonna Nyman is Leverhulme Postdoctoral Fellow at the University of Sheffield. Her research focuses on the politics and ethics of security, with interests in energy security, climate politics, and China. She tweets @jknyman. This piece draws on Jonna’s forthcoming book, titled ‘the Energy Security Paradox: Rethinking energy (in)security in the United States and China’, to be published by Oxford University Press 5 April 2018. It is available for pre-order here. Image credit: CC by Andreas Habich/ Wikimedia Commons.